Holiday season is a great time to organise your house — you're cooped up inside, and you actually have a few days to get things done. There's an explosion of storage and organising products to help you get things in order. We looked past the fancy stuff (someday, you luxurious custom closet solutions!) and instead collected a group of inexpensive, space-saving products for every room in the house. Fit more cookware in the cupboard. There are myriad rack systems that hold pots and pans from the ceiling. But if you don't want everyone looking at your cookware like they're ornaments, the PanTree (get it?) 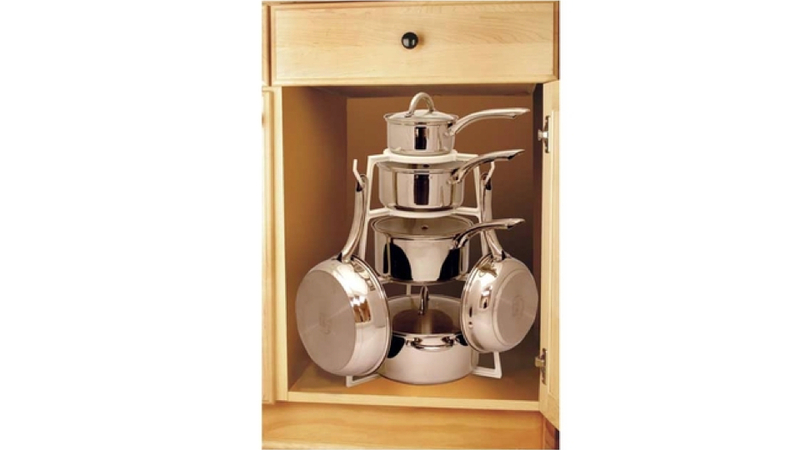 is a tiered rack with hooks that stores a lot of pots and frying pans inside the cabinet. ~$25. Hoist and store canoes and kayaks. 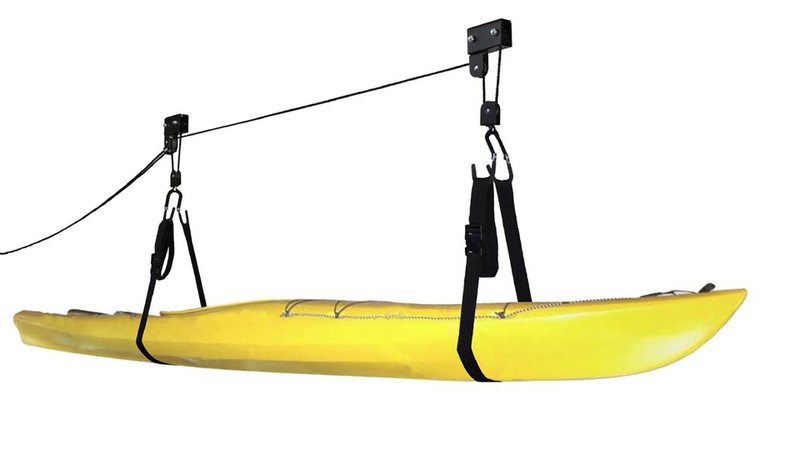 Pulley systems that lift a canoe or kayak right off the top of your vehicle and then store it near the ceiling make dealing with this unwieldy items conveniently fast and easy. But they're usually expensive. That's why we were surprised to see a hoist for this price. 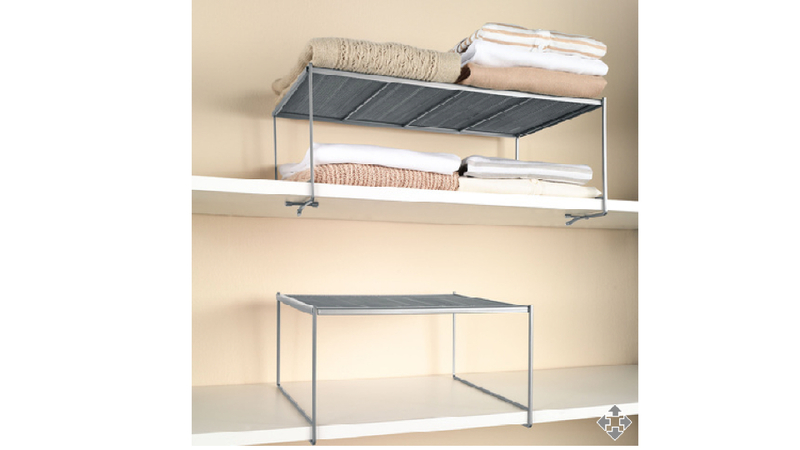 It's a great solution for storing space-hogging things and keeping them out of your way. ~$25. Lift bikes out of the way too. 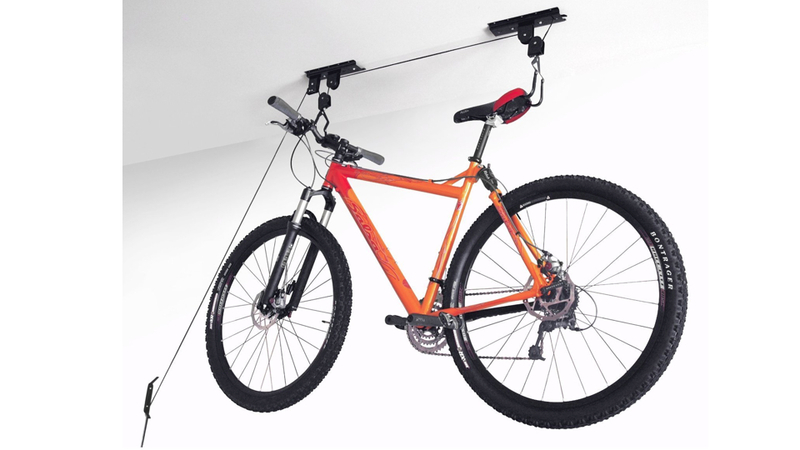 If you like the idea of hoisting and storing items at ceiling level but don't have a canoe, get a hoist system for your bike. It saves you from having to lift and manhandle the bike to set it on a hook like with other systems. Some hoists, like this one, are also quite inexpensive. ~$8. Place laundry supplies on a caddy. 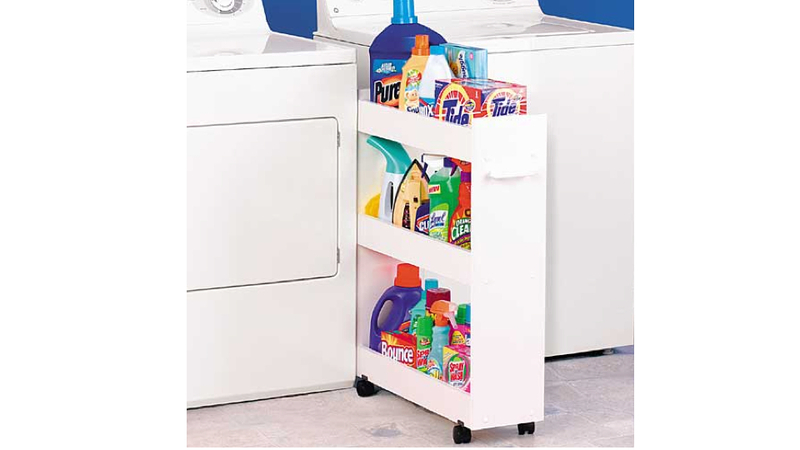 Store all your detergent, bleach and cleaning supplies on a wheel-around, three-shelf caddy with side rails that rolls in place between the washer and dryer. Everything you need for washing clothes is in a convenient location. ~$40. Store items near the ceiling. 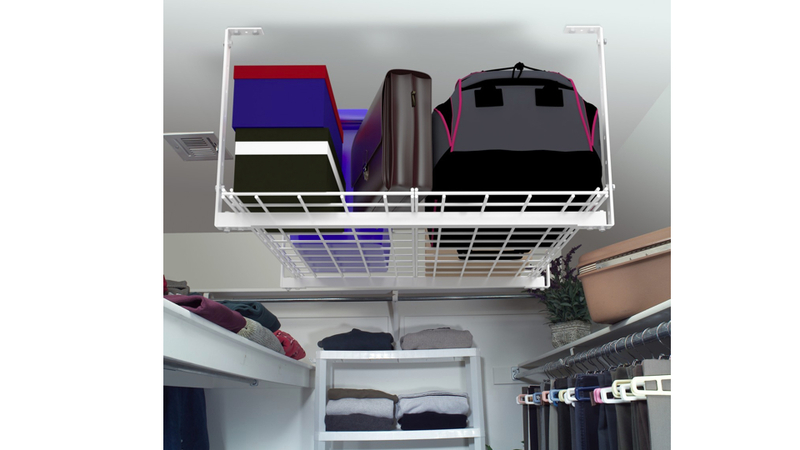 We've seen a lot of storage racks that get mounted to the ceiling for holding boxes or cartons, usually in the garage. But we've never seen one under $US40 like the Express. 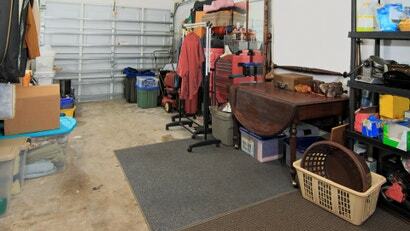 It can also be used in the basement or a closet to store seasonal clothing. The rack holds 70kg. ~$40. 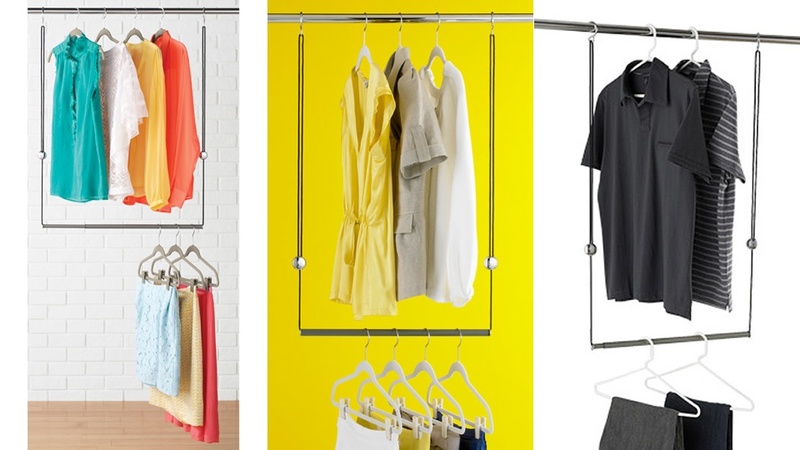 You can double the storage space on a high closet rod for $US20 or less. Attach the Dublet Adjustable Closet Rod Expander to a standard closet pole and set it for the right height in your closet. 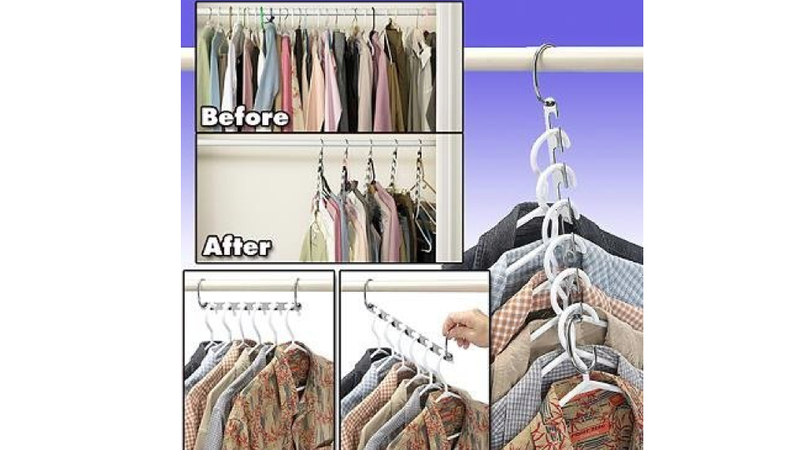 Hang clothes from the regular pole, then hook more hangers onto the extra rod below. ~$20. Hang even more shirts in less closet space. You may have seen the Hanger Cascade in an infomercial, but you probably haven't seen it for less than $US9 before. Put clothes hangers on it in a horizontal position, the drop it vertically so six hangers fit in the same space as one. Drawer dividers have been popular in kitchens for a long time as a way to store and organise silverware. They work just as well in dresser drawers to hold more clothing. 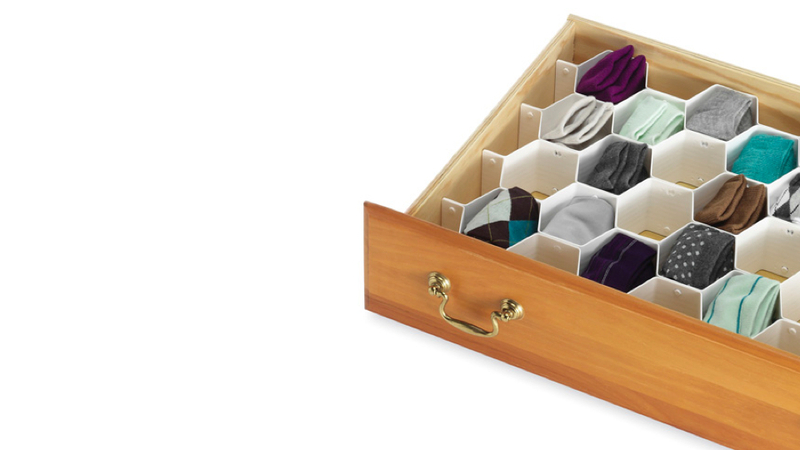 Go for this honeycomb design — it's perfect to hold socks, underwear and ties. 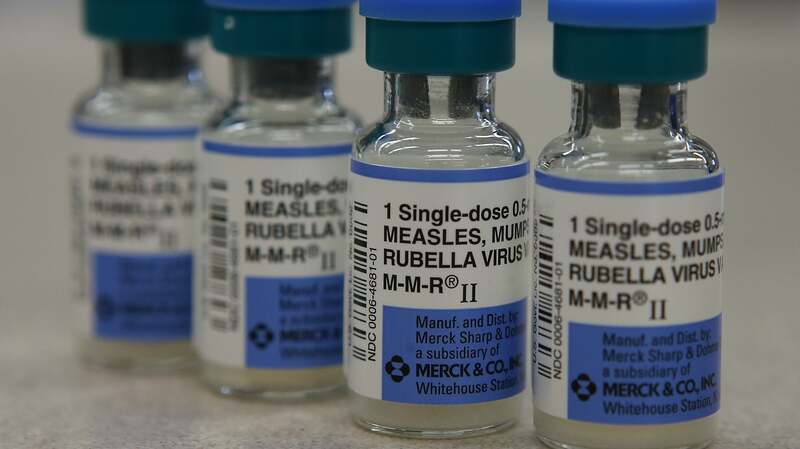 ~$11. Put toilet necessities with arm's reach. When you're on the throne and have some time to kill, it's nice to have reading materials and toilet paper in a convenient location. 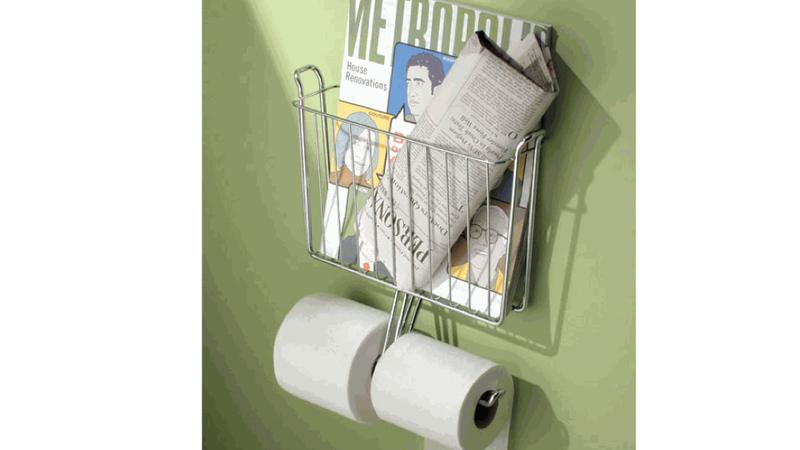 The Toilet Paper & Magazine Holder mounts to the wall to hold two rolls, newspapers and magazines. ~$14. Keep night-time essentials next to the bed. If you like having toilet essentials within arm's reach in the bathroom, consider the same thing for the bedroom. 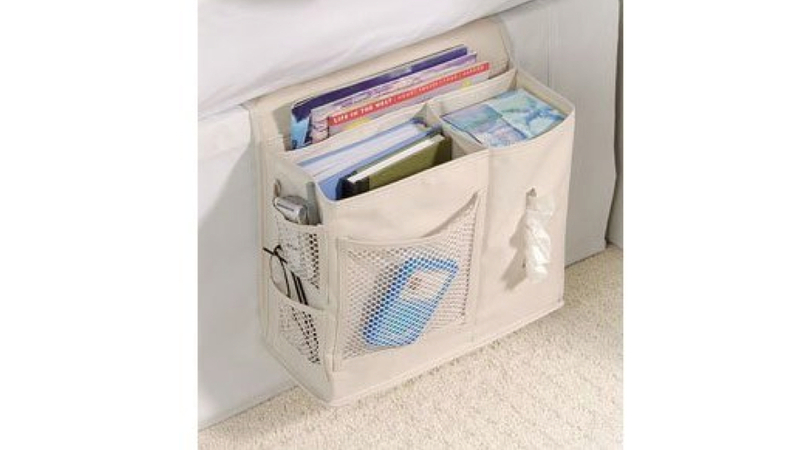 The Bedside Caddy holds your glasses, tissues, remote control and reading materials. But it's better suited to ereaders than heavy hardback tomes. ~$8. Install a rail of tool storage. Garages are always in need of more storage. A pair of 1.2m racks that hold lawn and garden tools is a good place to start. 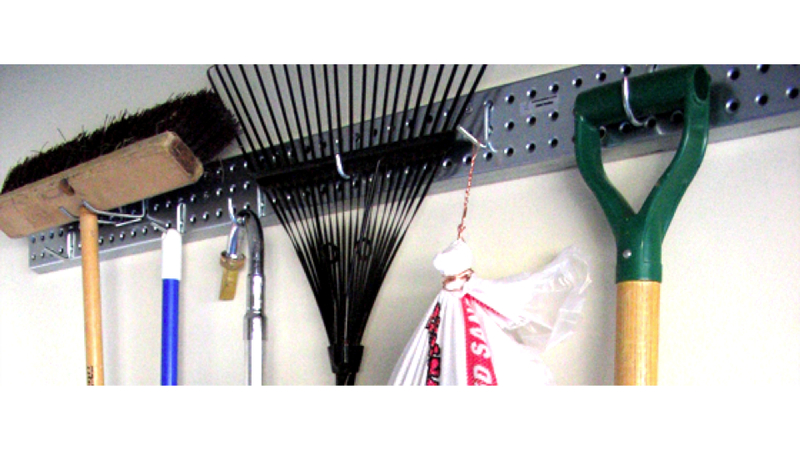 The Holey Rail is a steel pegboard that fastens to the wall, then you stick peghooks in it to hold the tools. ~$22. Have spices at your fingertips. Spice containers have a strange way of taking over a pantry or cabinet. 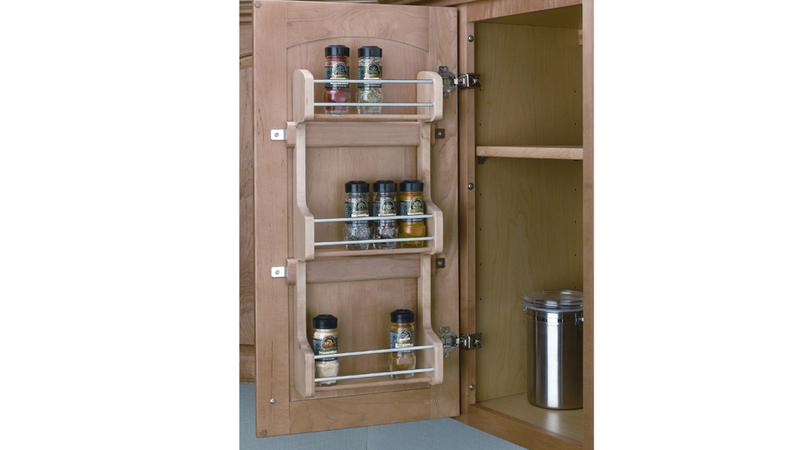 A door mount spice rack that attaches to the inside of a cabinet door stores the jars in an organised space. ~$34. Get twice the shelf space. A locking shelf instantly adds more space — typically double — to the shelves in your home office or closet. It slides over your existing shelf for added storage. It's a better solution than just stacking books or other items on a shelf and hoping they don't topple over. ~$15. 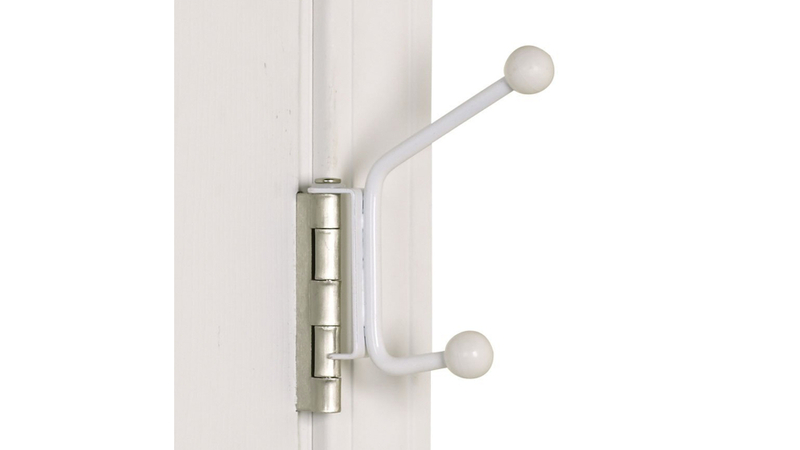 Make door hinges pull double duty. Backs of doors are great for storage. The Hinge-It Spacemaker takes a different approach than attaching a storage device to the door itself. Instead, it attaches to the door hinge, then provides a hook for a towel, bathrobe or whatever else you want to hang there. ~$8. Turn under-cabinet space into a wine rack. 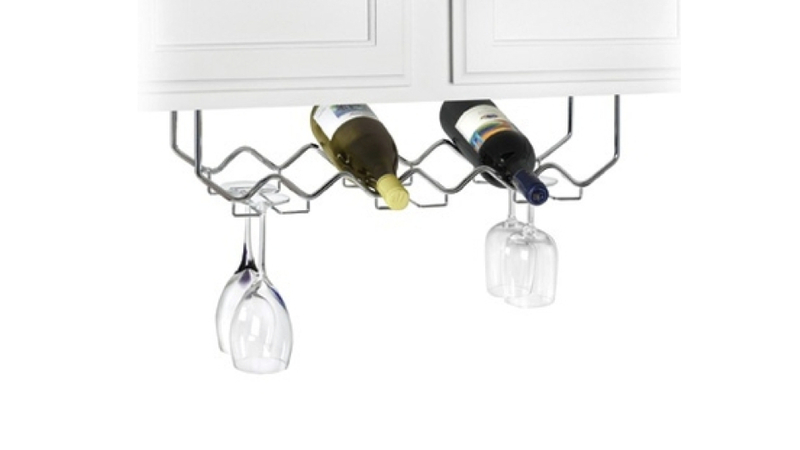 The Under Cabinet Wine Rack with Stemware Holder not only stores wine bottles, it displays them. And it displays wine glasses too. It utilises the space beneath the upper cabinets that's typically unused. ~$35.